Known for their lush foliage and supersized flower head, their shrub like appearance and long bloom period, hydrangeas are a common garden staple. How to feed hydrangeas is a common concern. 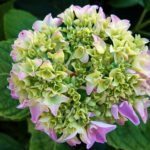 Hydrangea care and feeding is fairly simple once you learn some basic rules. Specially formulated hydrangea fertilizer is available but isn’t really necessary. A good all purpose 12-4-8 to 10-10-10 composition will provide all the fertilizing hydrangeas need. Either a chemical source or organic matter can be used successfully. Applying a once a year slow-release chemical formulated for shrubs and trees is the simplest solution to hydrangea care and feeding. A less expensive fast-release compound will work as well. 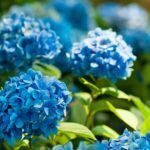 As to what to use to naturally fertilize hydrangeas, a combination of sulfur, compost and peat moss has proved to be a successful hydrangea fertilizer. Be sure to spread it around the drip line of the branches and not the base. Water well. If the fertilizer you choose is a slow-release type, remember to lightly cover it with soil to activate the fertilizer. How to feed hydrangeas should also include a light bi-annual dose of liquid iron to keep the leaves a healthy green. 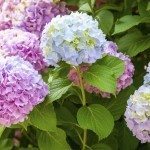 A discussion of how to fertilize hydrangeas wouldn’t be complete without mentioning the addition of small amounts of sulfur or lime when fertilizing to change hydrangea color. Hydrangeas treated with sulfur will remain or turn blue. Lime results in pink and a change to either color takes time. Please note: white hydrangeas will not change color. Gardeners who practice good hydrangea care and feeding will be rewarded with luxurious foliage and glorious blooms.